Lift And Place VERSA-LOK Square Foot Retaining Wall Units Easily. 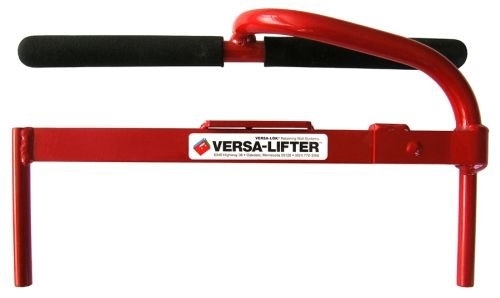 The VERSA-LOK Square Foot Lifter makes it easier to lift and place VERSA-LOK Square Foot units, especially on the base course. Prongs on either end of the Square Foot VERSA-Lifter are placed in the retaining wall unit's end holes, and, as the hinged bar is lifted, the prongs grip the holes, and the weight of the block secures its hold. The two-handed carrying handle has a comfortable rubber sleeve and is positioned to balance the unit evenly for maximum ease in carrying. NOTE: Not for use with VERSA-LOK Standard units.